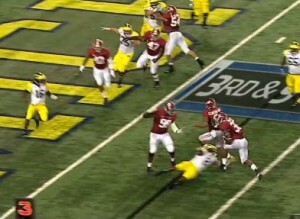 Anyone who watched the national championship game remembers the play. C.J. Mosley had just intercepted LSU quarterback Jordan Jefferson's pass and then suddenly, his leg bent in a funny way. It was a nasty injury. No one knew at the time that Mosley had injured his hip-fortunately for Mosely, the injury only kept him out of action for a month. "I was lucky enough and blessed enough to get back on the field and do what I’m doing now," Mosley said. And the Tide is lucky to have him and his leadership back on the field this fall. Mosley leads the team in tackles with 65 and has two interceptions. To read more about Mosely's injury and comeback, check out this link from AL.com.